Five years of data collected on reefs and offshore in Bermuda shows that coral reef chemistry – and perhaps the future success of corals – is tied not only to the human carbon emissions causing systematic ocean acidification, but also to seasonal and decadal cycles in the open waters of the Atlantic, and the balance of biochemical processes in the coral reef community. 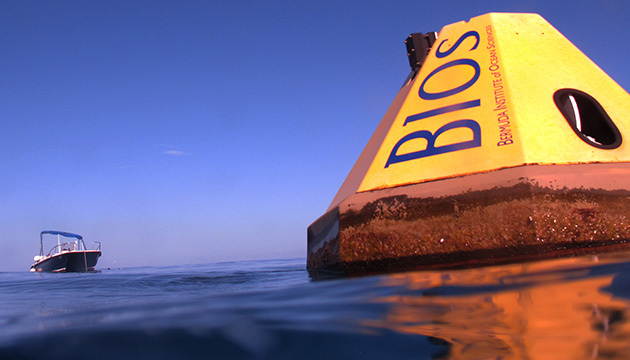 In a study published this week in the Proceedings of the National Academy of Sciences, a team of BIOS researchers documented two periods of intensified ocean acidification on the reef that coincided with major blooms of microscopic plankton measured offshore. As currents deliver the plankton and detritus to the reef, corals capture and consume it with their tiny stinging tentacles. This new source of energy is invested in growth through calcification, which removes skeleton-building minerals from the water to grow the reef structure, and respiration, which produces carbon dioxide that acidifies seawater. These processes exacerbate ocean acidification on the reef. Scientists collected the offshore information from the Bermuda Atlantic Time-series Study (BATS), which has provided the world’s longest and clearest record of ocean acidification resulting from rising carbon dioxide in the atmosphere and has generated concern for the future of coral reefs around the world. However, as this new study illustrates, coral reefs do not just passively experience the pH of the ocean washing in with each tide. As corals grow, their own biological processes such as photosynthesis, respiration, and calcification impact the water’s chemistry. Depending on the balance of biological processes, coral reefs can actually exacerbate or alleviate the acidification of the reef seawater, said Andreas Andersson, BIOS adjunct faculty and associate professor at Scripps Institution of Oceanography. He worked on the project with Scripps graduate student Kiley Yeakel and a team of BIOS researchers led by senior scientist Nicholas Bates. While the strong acidification events on the reef corresponded to times of higher open-ocean mixing and phytoplankton blooms measured at BATS, these open ocean events, in turn, have been related to the North Atlantic Oscillation. Similar to El Nino in the Pacific, the North Atlantic Oscillation is a periodic back-and-forth shifting of atmospheric pressure differences across the North Atlantic. By monitoring the reef water for several years, the team was able to relate this large-scale process observed at BATS to conditions for coral reefs.